I have been convinced that it would be better for the worst offending counties in Europe to default than to allow Europe's banking system to melt down. And I recall someone saying that when it happened there would be a great effort to hide the news. It happened - both. It is shocking and sad but Greece asked for it and the other Euro-zone countries allowed them to. Detroit was very successful in 1950 - highest per capita income of all US cities. But then they adopted every progressive dream. And look how far Detroit has fallen. - A "living wage" ordinance, far above the federal minimum wage, for all public employees and private contractors. - A school system that spends significantly more per pupil than the national average. - A powerful school employee union that militantly defends the exceptional pay, benefits and job security it has won for its members. - Other government employee unions that do the same for their members. - A tax system that aggressively redistributes income from businesses and the wealthy to the poor and to government bureaucracies. Detroit is a corrupt, bankrupt mess. Do you think it is a coincidence? Not likely. We honor President Washington for his heroic leadership in the founding of our country. He was sold as a rock in leading the Continental Army. Then at victory, at the peak of his power, he could have been king, but he retired to his farm. He was asked to oversee the writing of the US Constitution. Not to lead it - Madison and Hamilton did that - but just to be present, so the proceedings stayed proper. Then when acclaimed president he rejected being president-for-life and retired after two terms. George Washington's Sacred Fire by Peter Lillbeck shows Washington to be a man, who, faced with unprecedented challenges and circumstances, ultimately drew upon his persistent qualities of character - honesty, justice, equity, perseverence, piety, forgiveness, humility, and servant leadership, to become one of the most revered figures in world history. On the Olympic Peninsula of Washington? Yes. 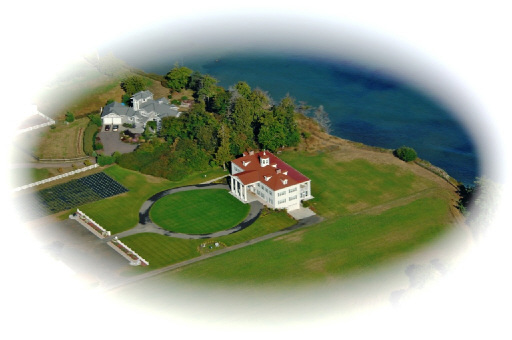 In the super rain shadow, between Port Angeles and Sequim, Washington there is a replica of Washington's Mount Vernon on a bluff overlooking the Straight of Juan de Fuca. It looks perfect. And what a great setting for it. The photo: From George Washington Inn. Those who are always promoting making voter registration easier and easier always ignore the problem of ineligible people voting. They just want more people to vote. We say, "But making it easier ineligible people voting, like non citizens or convicted felons who have not had their vote reinstated." They response that ineligible people might be registered, but they never vote. Never. It is just over-eager registration collectors (who are paid). Oh, Never? In Florida law enforcement is investigating non-citizens voting. Voter fraud is a third-degree felony in Florida. It wasn't hard to find the non-citizen voters. They looked at the excuse forms for jury duty for "I cannot serve because I am not a US citizen." My kind of people - explorers. They blog their explorations at Puget Sound Explorers. They recently spent a day where I spend days every months - Key Peninsula in South Puget Sound, west of Tacoma. They spent time at Creviston Valley Farm and Trillium Creek Winery. I haven't taken in this farm yet, but I have had the tour at the winery and bought their wine. I am not the person to carefully judge wines, but I will buy theirs again. There is much more to include in an exploration of Key Peninsula. Bed and breakfasts - Glen Cove Hotel is big on hosting weddings. Shoreline State Parks - Penrose Point, which is a star, and Joemma Beach, which is nice. Lavender Farms - at least two of them. Parks. For such a laid-back rural area the city and county parks are pretty good. There is even a new little park with beach access. And for strange history, the town of Home, which had its post office closed, then the post office of tiny Lakebay was moved there. Yes, a town whose post office has the name of another. I need to find a good write up of this. Dr. Art Coday is running for the US Senate seat kept warm by Maria Cantwell. Coday is a Harvard-trained, primary-care medical doctor whose practice is with Medicare and Medicaid patients. He ran two years ago, but stepped down when Dino Rossi announced his candidacy. He then ran for legislature and outperformed Dino Rossi in a strong Democrat district. 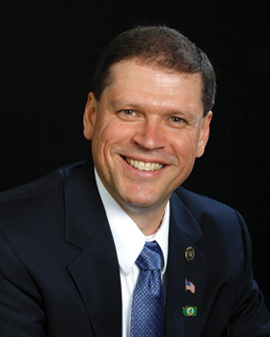 Coday is very effective at explaining limited government and growth-oriented economic policy and knows health-care issues including Obamacare inside out. A great resource for the wildlife viewer. There is a system of 25 on-shore (mostly) sites that are good for viewing marine mammals, especially orca whales. 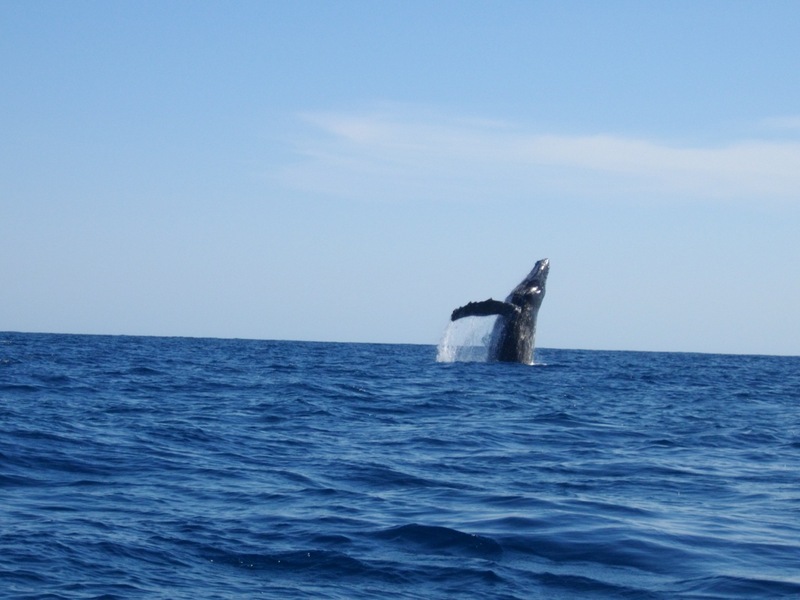 Washington waters also regularly host gray and humpback whales and sperm whales were seen this year. They are in Puget Sound, Staight of Juan de Fuca, on San Juan Island, one on the Pacific Coast. The exception to the on-shore rule is -- on all Washington State Ferries. There is great viewing on the ferries, but who gets to spend much time on them? None of the sites are south of the Tacoma Narrows where we hang out. In the South Sound we have hundreds of resident harbor seals and California sea lions come every year during the darker months. But whales don't regularly go south of the Tacoma Narrows. Though they sometimes do; our next-door neighbor had a close encounter with two orcas (as I recall) about five years ago when he was on his boat that was anchored. Being anchored means he was in shallow water, probably 5 feet of water at our lowest minus 4 tides. And less than two hundred meters from our bulkhead (high tide mark). He had no warning: suddenly they come up near him. The photo: It's mine! I took it from a 20-foot panga boat in the Pacific Ocean about two miles off the shore of Cabo San Lucas. With my pocket-size digital camera I never use more than 3x telephoto, so you know we were close. When this close you make sure you are following the whale. Don't get in front of hime. 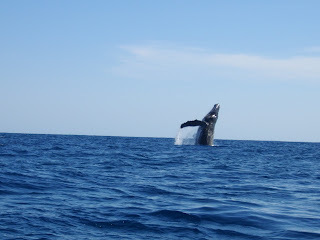 We only saw this one whale, but he breached like this continuously for half an hour! Click to enlarge. I listed my father's little Kelsey Excelsior 3 by 5 inch printing press for sale on Craigslist. It is small, but heavy. 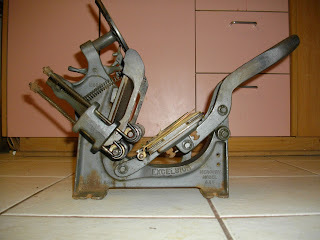 A very nice piece of machinery. Ryan Lewis is happy and growing after his first birthday. He nearly died in his first month because his liver was severely damaged before birth. He received a liver transplant and made many overnight hospital stays. Ryan is my niece's son. There has been a lot of prayer go up from this household for him and his family. Yesterday she killed a source of oil while saying that. I admit that this is not a story with wide interest. But I grew up in West Seattle and worked for Boeing for decades. And my last Boeing project before retiring was with Flight Test. Flight Test is located at Boeing Field, of course, but several hundred people, including me, were/are across the Duwamish River in South Park. So during my last four months of work I drove over this bridge every day. The 16th Ave SW bridge aka South Park bridge was closed in June, 2010, due to age and just plain wearing out. The politicians showed up for the cameras, but didn't work together to get its replacement going until after it closed. 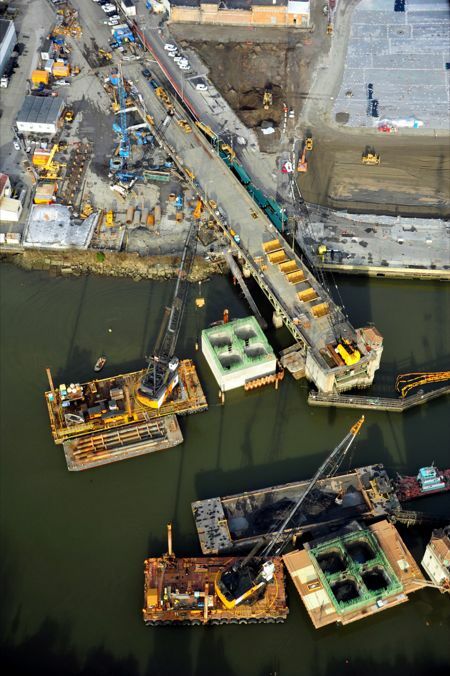 Construction is began in August, 2011, and the new bridge is scheduled to open in mid 2013. 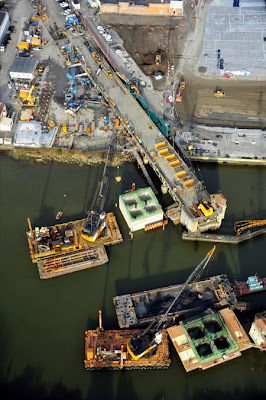 West Seattle blog is also following it, of course, with recent photos from pilot/photographer Long B. Nguyen. This past June, Mr. Chaffetz introduced legislation (H.R. 828) which would terminate the employment of current federal employees and prohibit the hiring of future federal employees who have a “seriously delinquent tax debt.” Similar legislation was introduced during the 111th Congress (H.R. 4735). Each employee terminated would be subject to due process. The Daily Caller published a column by Mr. Chaffetz on this subject in March 2011. According to FERDI, more than 98,000 federal civilian employees owed $1.034 billion in unpaid federal income taxes in 2010. When retirees and military personnel are included, nearly 280,000 people owed $3.4 billion. Currently, only IRS employees can be terminated by their agency for non-payment of federal income taxes. Current news sources say that Chaffetz's bill allows, not requires, firing, but his own web site says "would terminate…"
Honorable Senator Harry Reid announced that his Senate won't fulfill the budget process this year. The Democrats' budget would be the rough numbers that were cobbled together behind closed doors in the crush of the Obama-made debt-ceiling crisis last August. Why would he want to write a budget? If they build the budget they have to show the American public how they plan to spend more than they bring in. And how they plan to raise taxes. For cover Senator Conrad of ND intends to do the first step of the process, then set it on the shelf. That won't fulfill the process required by the budget law either. Follow the law? Harry Reid? And what will our two senators do with all their free time? Take another year off. This is the third year they have flouted the law and not built the budget. Sessions argued Senate Democrats don’t want to spell out a long-term budget plan for fear of public scrutiny. "[Reid] obviously continues in his belief that it would be politically foolish for his members to go on record in support of any long-term vision," he said. "But by refusing to lay out a budget plan for public examination — a fact no one can deny — the Democrat Senate has forfeited the high privilege to lead this chamber." … Sessions argued that the spending caps under the debt-limit agreement "crafted behind closed doors and rushed to passage at the 11th hour under threat of panic, do not even approach the definition of the budget process that the [Budget Control Act] law requires." "They are not in any way or any sense a Senate Democrat budget plan," Sessions said. "There is no argument that can be made that these caps are a long-term vision for this country — not on taxes, not on entitlements, not on spending, not on debt." "They're attacking us because they have nothing better to do. They need something else to talk about." "I WILL be held accountable. You know, I've got four years. ... A year from now, I think people are gonna see that we're starting to make some progress, but there's still gonna be some pain out there. If I don't this done in THREE years, then there's gonna be a one-term proposition." You are right, Mr. President! There is the door. Obama's Jobs Commission says The US needs energy for our economic development. So Obama kills energy sources AND jobs. And this is despite detailed study showing no impact on the environment. Understanding the economic implications, Democratic Senators Max Baucus, Jon Tester, Joe Manchin, Ben Nelson, Mark Begich, and Mary Landrieu have all expressed support for the pipeline. Energy Secretary Steven Chu did not explicitly support the pipeline but did acknowledge that “it’s not perfect, but it’s a trade off” and that Canadian oil sands producers are “making great strides in improving the environmental impact of the extraction of this oil.” These are bold words from a man who has unabashedly derided fossil fuels in support of renewable energy and welcomed high gas prices. President Obama’s former “car czar” Steve Rattner also emphasized that the president should approve the pipeline permit. The one person who deserves no credit for the oil and gas boom is the person who claims it - Barack Obama. In fact, this Administration has bent over backwards to make oil and gas production and exploration as difficult as possible. "... 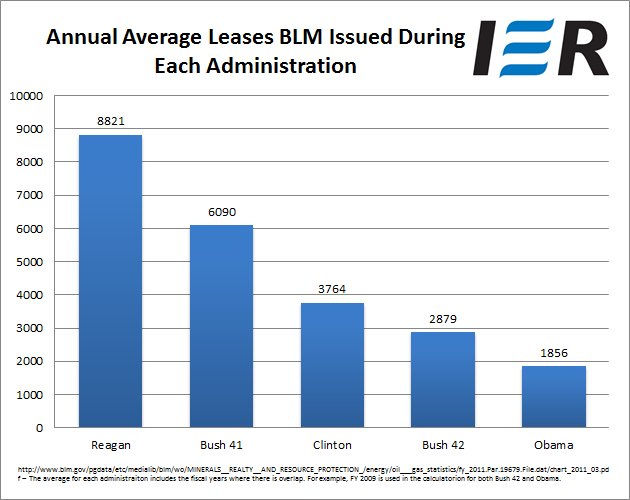 According to the Institute for Energy Research (IER), the Obama Administration has been issuing BLM oil and gas leases at the lowest pace of any president in the last 30 years – in fact at half the rate of the Clinton White House and 80% slower than in the Reagan era, dragging their feet to please the environmental lobby (see top chart above). 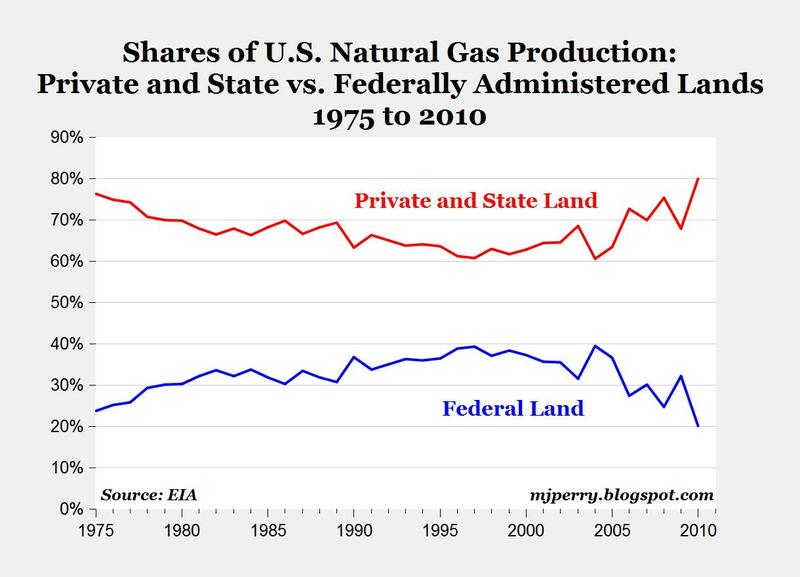 By comparing oil and gas production on Federal vs. state and private lands, we can get a true read on this Administration’s energy policy. Since Obama took office, according to the Institute for Energy Research, oil production has fallen precipitously on Federal onshore and offshore leases, while it has increased by an even larger amount on state and private lands largely outside of this Administration’s reach. 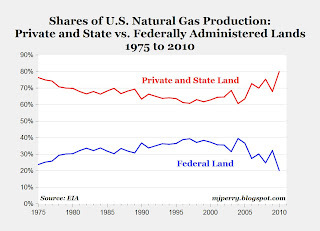 The only reason total oil [and gas] production has increased since Obama took office is because private companies on state and private lands have increased production enough to offset the large drop that has occurred in Obama-controlled producing regions. Obama’s taking credit for the current oil and gas boom ranks up there in the pantheon of great political whoppers right next to Al Gore’s invention of the Internet."